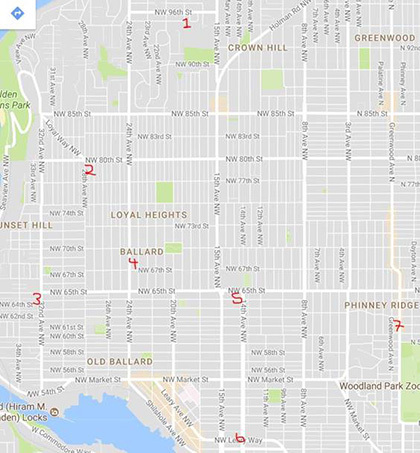 This past May, Seattle City Light crews completed temporary repairs on several failed streetlights in the First Hill neighborhood. Crews completed these streetlight repairs during the week of May 21, 2017. The failed streetlights were caused by multiple system failures and aging electrical infrastructure. To temporarily restore power to the streetlights, City Light crews connected overhead cables from Terry Avenue and Madison Street towards Boren and 9th avenues. The repairs will be an improvement in safety for roadway and pedestrian travel through the First Hill neighborhood. In 2018, Seattle City Light will return to First Hill to permanently replace fix the aging streetlight system, as part of the Seattle Department of Transportation’s Madison Busway Rapid Transit (BRT) project. City Light is committed to making these improvements to improve the electrical reliability for the neighborhood’s streetlight system. Seattle City Light recently completed the final upgrades on several utility poles in support of the Advanced Metering program. Crews replaced 27 different poles across City Light’s service territory with new 70-foot poles and wireless infrastructure. The taller pole helps support the new wireless equipment by transmitting data for the utility. A wireless communications network is also in place to help support the Advanced Metering program, which will automate meter reading and enable enhanced services for City Light customers. Throughout the project, crews also used the opportunity to upgrade the infrastructure and replace poles in poor condition. City Light appreciates the patience of its customers during the construction of this project. Starting in mid-to-late May 2017, Seattle City Light will be supporting enhanced cellular and data services along Beacon Avenue South and Ballard Avenue Northwest by upgrading electronic equipment to utility poles throughout the public right-of-way of these neighborhoods. Map of the construction work areas along Beacon Avenue South and Ballard Avenue Northwest. This project is an expansion of existing communications networks. The equipment modifications will increase public safety and enhanced-911 capabilities. The work will also improve wireless services to areas, allowing for enhanced connectivity and faster 4G service. These projects are tentative to start in mid-to-late May 2017. Construction along Beacon Avenue South is expected to last approximately three to four months. Construction along Ballard Avenue Northwest is anticipated to last approximately four to five weeks. Daily work hours are from Monday to Friday, 8:30 a.m. to 4:30 p.m.
For more information, please contact Gina Del Giorgio, City Light Project Consultant at (425) 603-8205 or Regina.DelGiorgio2@VerizonWireless.com. Visit Seattle City Light’s construction website for the latest updates on this project: http://www.seattle.gov/light/atwork/release.asp?RN=326. Starting in mid-to-late May 2017, Seattle City Light will be working to improve pedestrian safety in the First Hill neighborhood by temporarily repairing 18 failed streetlights on Madison Street, spanning from Minor to Terry avenues. Crews will connect overhead cables from Terry Avenue and Madison Street towards Boren and 9th avenues to restore power to the failed streetlights. Map of the construction work area along Madison Street. The project will improve safety for roadway and pedestrian travel. Repairs will increase electrical reliability and streetlighting for the First Hill neighborhood. Crews may be working on both sides of Madison Street to span cable across the street. Customers can expect temporary parking and lane restrictions in the immediate work area during construction hours. Traffic control flaggers and uniformed police officers will be used to maintain traffic and pedestrian safety through Madison Street and its intersections on Terry, Boren and Minor avenues. Construction is scheduled to begin on Sunday, May 21, 2017. Daily work hours are from Mondays through Fridays, 9 a.m. to 3 p.m., with possible evening and night work. The entire project is expected to last approximately five days. Visit Seattle City Light’s construction website for the latest updates on this project: http://www.seattle.gov/light/atwork/release.asp?RN=388. Seattle City Light is hosting a public hearing on the disposition plan for the utility’s 800 Aloha Street property on May 1, 2017 at 7:00 p.m. The public hearing will be located at the Museum of History and Industry (MOHAI) at 860 Terry Ave N. in Seattle. City representatives will be collecting public comments on City Light’s plans to dispose of the property at 800 Aloha Street, per requirements by Revised Code of Washington (RCW) 35.94.040. All comments must be received by May 5, 2017 to be included in the record developed for the Seattle City Council. Later this month, Seattle City Light will continue replacing aging utility poles in parts of the utility’s service territory to improve and upgrade electrical reliability for customers. City Light’s contractor, Magnum Power LLC, will be installing new utility poles, relocating wires and replacing aging equipment in the Beacon Hill neighborhood. Work hours are scheduled from Mondays to Thursdays, 7 a.m. to 5 p.m. This project is anticipated for completion by the end of 2017. Map of the construction work area in Beacon Hill. Pole replacements will occur within this area. The new poles will be placed alongside pre-existing poles. They will meet standard heights and widths required for overhead power line construction. This may mean that poles in the area will be slightly taller and approximately two inches wider than existing poles. Maintenance power outages are required for this work. Crews will place a door hanger or make personal contact within 48 to 72 hours of the outage date. The notification will specify the date, time and duration of the outage. Once the electrical equipment is relocated, it may take several months before the other companies with utilities on the existing poles make their transfer(s). We will continue to monitor/coordinate these efforts as needed to facilitate the removal of old poles. Percy Schlimm, Senior Electrical Service Representative at percy.schlimm@seattle.gov or (206) 386-1735. Kevin Knutz, Magnum Power Project Manager at kevin@magnumpowerllc.com or (360) 904-8318. Visit Seattle City Light’s Pole Replacement Project Website for the latest updates on this work. This website will be updated regularly as more utility pole locations are added. Starting in early to mid-April 2017, Seattle City Light will be supporting enhanced cellular and data services in the Highline and White Center areas by upgrading electronic equipment to 35 utility poles throughout the public right-of-way of these neighborhoods. Map of the construction work areas in White Center and Highline. Crews may be working on multiple poles within each work area. This project is anticipated to start in early to mid-April 2017. Construction is expected to last approximately six weeks. Daily work hours are from Monday to Friday, 8:30 a.m. to 4:30 p.m.